This is a nature story that has nothing to do with bears in the woods. It happened to our own barrister extraordinaire, Warren Sparrow, one morning last week. 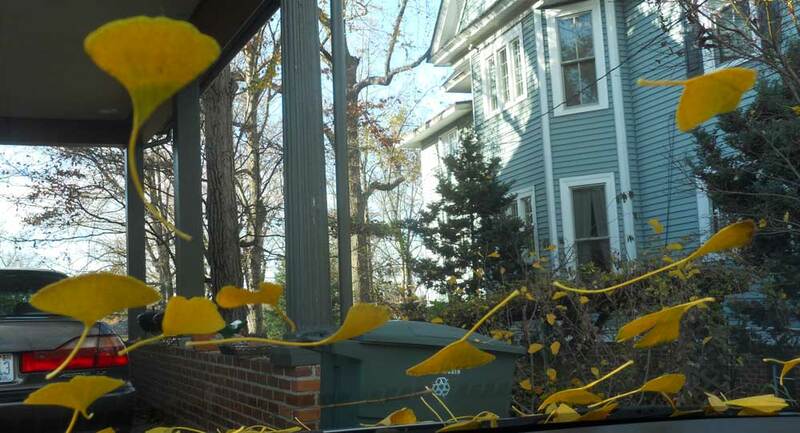 He went outside, got in his car and guess what he saw splattered on his windshield? It was, what could best be described as nothing less than a “work of art!” drawn by mother nature herself! Now those less sensitive souls, not properly schooled in art appreciation would probably just think it was nothing more than leaves that had fallen overnight on Warren's car. Balderdash! Warren and the rest of us might have thought the same thing once upon a time when we were young and hungry and climbing ladders. But as age begins to slow us down, I believe it brings with it an enhanced appreciation of the incredible beauty that has surrounded us all our lives. Either that, or Warren was hungry that morning. Brain areas such as the anterior insula and orbitofrontal cortex that are activated by pleasant smells or tastes are also the parts of the brain that are active when we are awed by Renaissance paintings or Baroque concertos. There is virtually no evidence that artworks activate emotion areas distinct from those involved in appraising everyday objects important for survival. Hence, the most reasonable evolutionary hypothesis is that the aesthetic system of the brain evolved first for the appraisal of objects of biological importance, including food sources and suitable mates, and was later co-opted for artworks such as paintings and music. As much as philosophers like to believe that our brains contain a specialized system for the appreciation of artworks, research suggests that our brain’s responses to a piece of cake and a piece of music are in fact quite similar. Nevertheless, Warren, I still like it! It sure beats what Mother Nature's little feathered painters leave on my windshield every morning!